It is not uncommon for these deep notches to be a bit sloppy, causing the string to rattle as it vibrates, hitting the sides of the notches. 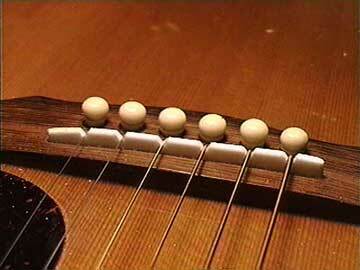 Saddles should not be notched at all, so the string rides cleanly over the top, contacting at a single point for greatest clarity of tone. Simply filing the saddle to the height of the bottom of such notches and rounding the top edge will clear up the problem right away.